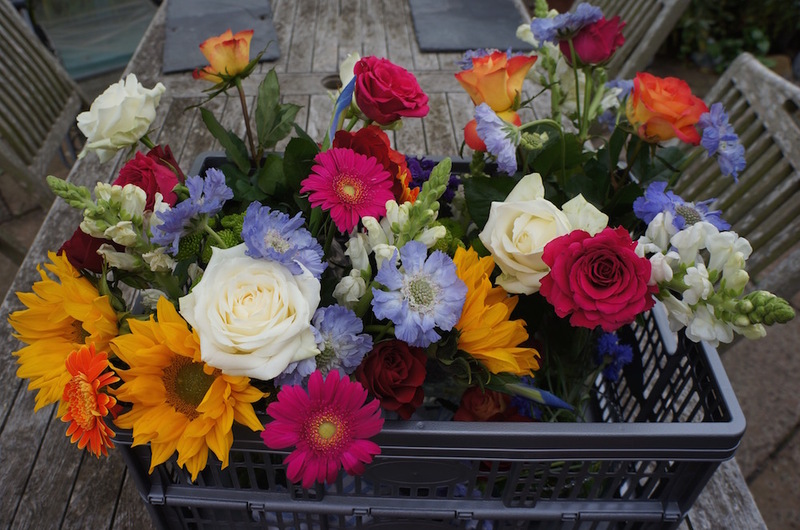 We ended summer with a celebration – painting fresh flowers with Olivia Quintin for two days. 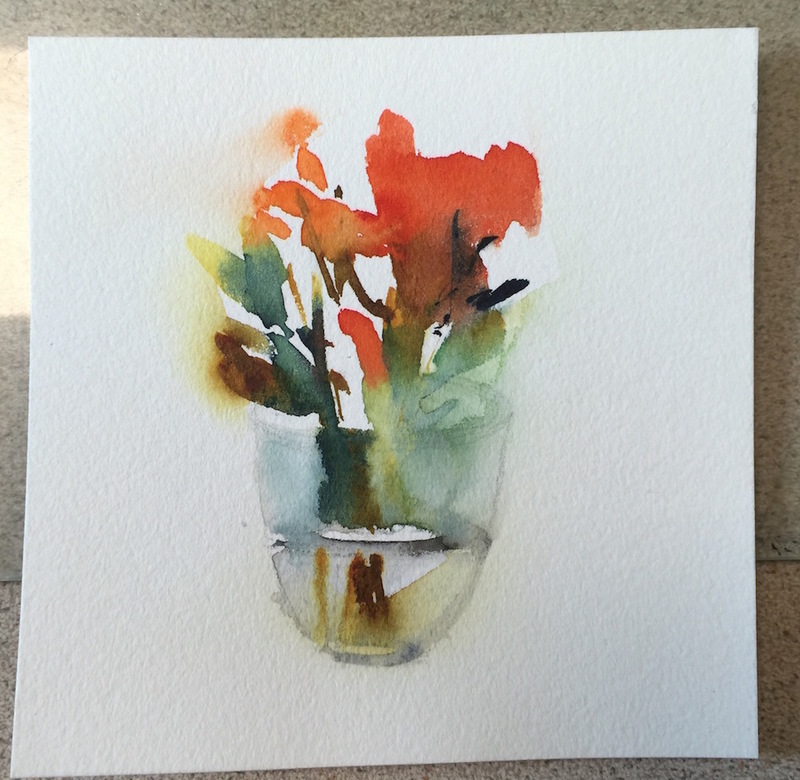 A full house of 14 artists came to spend the weekend painting fresh flowers. They came from the local area, from 2 hours drive away south of London, and some even flew in from Holland. From my experience of painting in Belle Île with Olivia, I’d say she attracts wonderfully diverse groups of artist – all of whom have one common factor: the desire to paint with Olivia. Feedback from the workshop was overwhelmingly good with most of the artists wanting to come back and paint with Olivia again next year. Olivia’s preparation for the workshop was impressive. She came ready with exercises designed to allow artists to paint the same subject at each stage, but at a level that suited their own experience. The day before the workshop we loaded up with flowers. The weather was cool so they were kept fresh outside in the shade until they were ready. Our garden was even more blossom-filled than usual for a couple of days. 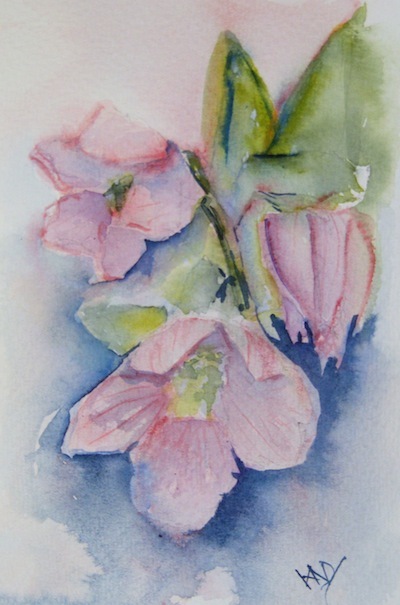 At each stage, Olivia demonstrated the particular watercolour technique she wanted her students to master. It didn’t take long before everyone was completely enthralled and happily practicing new skills. Olivia brought her glorious watercolour earrings along with her, much to the delight of those with pierced ears, and some who got in a bit of early Christmas shopping. 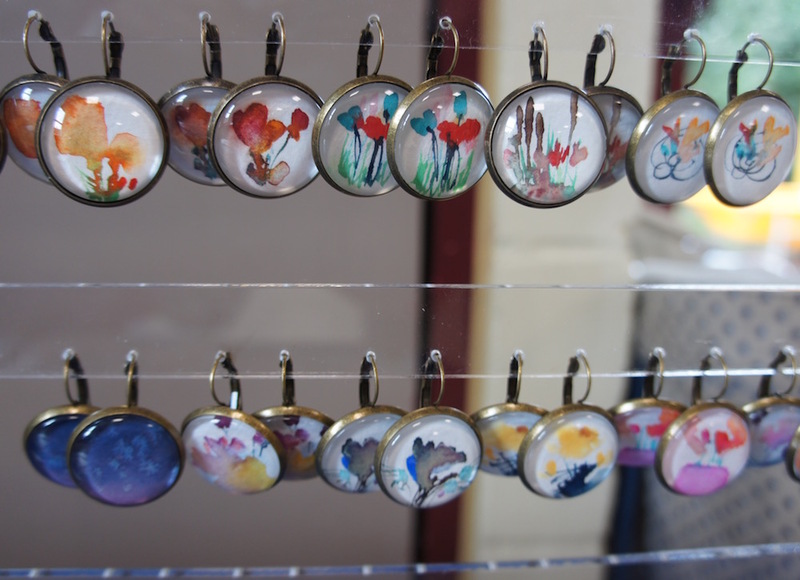 Olivia’s earrings and other watercolour jewellery are sold in her Etsy shop and it was brilliant to be able to see them in the flesh, succumb to the temptation and buy a few pairs. Our two days of painting fresh flowers went past in a flash. 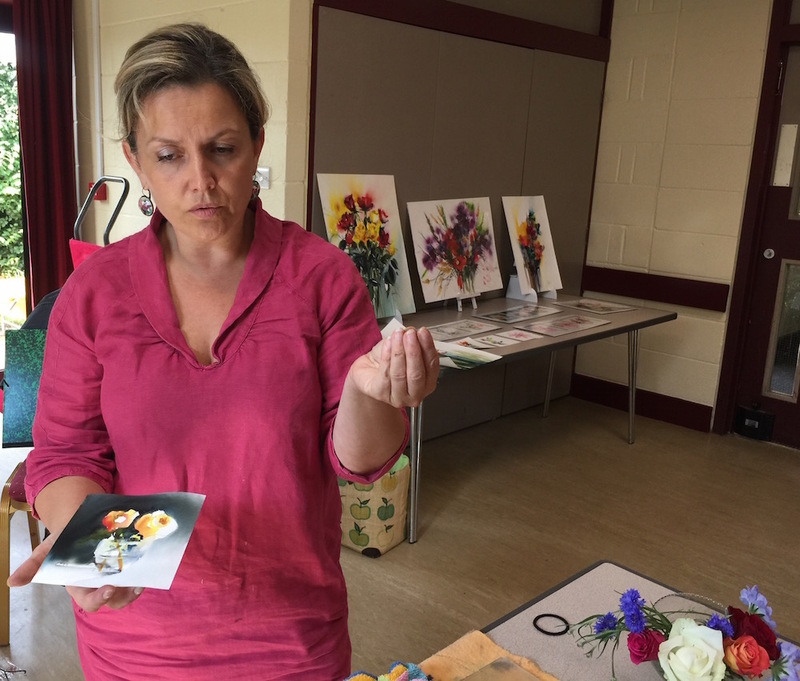 My Facebook feed is showing images of flower paintings being done by some of the attendees – so the flower painting continues beyond the workshop. If you follow me on Facebook, you’ll see some more of my workshop paintings posted there, and more to come. There’s a bit of a buzz in the house at the moment. We’re getting ready for Cambridge Open Studios in a fortnight. I had the pleasure of going to see the studios of two other artists yesterday, both are experienced artists and have strong styles. They have very different styles of Open Studios and I was impressed by them both for different reasons. Jo Tunmer and Claire Marie Wood inspired me in different ways which was fabulous when faced with a weekend of framing, and organising to get ready. And it was lovely to have a chance to visit a couple of other studios. So often its not possible if your studio is open on the same weekends. My Running With Brushes will be on display providing some exposure for the project. I wish I could display the whole collection, but even without being able to show the works of other artists, it should raise awareness. We’re having an Art Safari in the village to make Whittlesford a good destination for Cambridge Open Studios visitors. With 4 artists works on display within a 5 minute walk, visitors will have plenty to see. It’s taken a bit of organising – firstly to make sure we could all be open on the same days, then to arrange our preview evening for the same time and date. 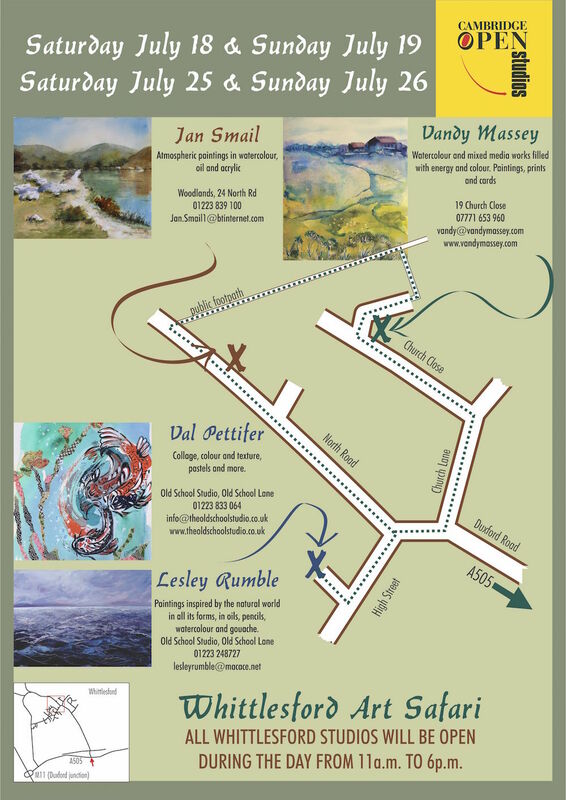 Finally, we got the marvellous Lori Bentley to design our map which will be available at all studios and has gone out in 400 guidebooks around the area. 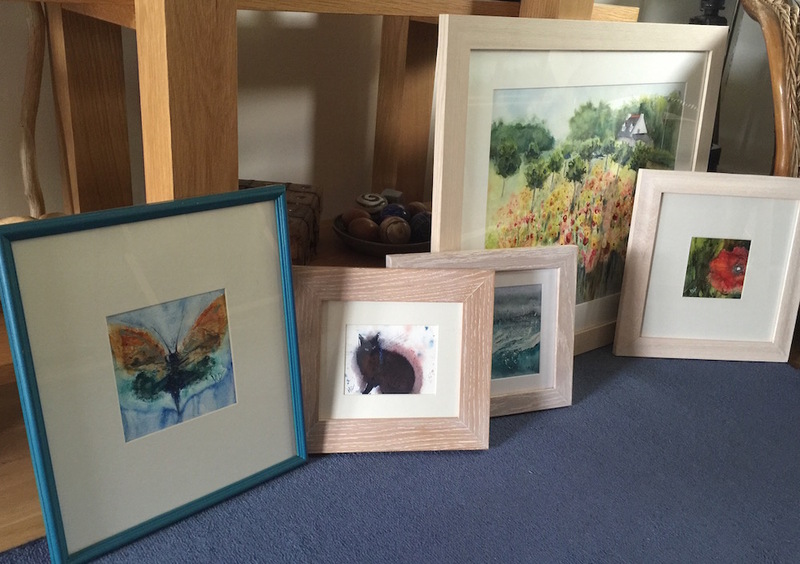 Between the four artists taking part, many mediums will be on display: watercolour, pastel, oil, acrylic and collage. The range is rich and the colours vibrant. If you’re in the area, pop in for a coffee and say hello. In our house, when we the boys were young, we had early wake up calls every Christmas morning so that present unwrapping could start as soon as possible. These days, we have the luxury of a late start and an even later lunch since the present sessions can be done at a less urgent pace now. But for those who still have an early start on Christmas morning, here’s the Advent give away cockerel who is bound to crow at daybreak. 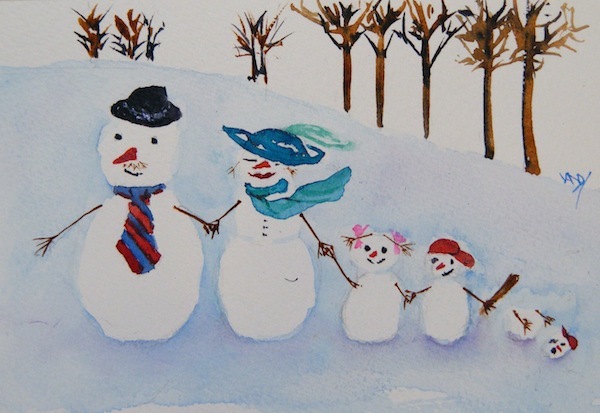 Today’s advent artist is Marc Massey. Marc’s photographs have always provided great reference material. He’s going to be running photography workshops at The Old School Studio in the new year. On top of all that, Marc does all the mounting of the Running With Brushes paintings and my paintings. We’ve passed the 300 painting mark and every single one of them has been mounted and packaged by Marc. Today’s advent give away painting is one that had to be painted at some stage in the series. 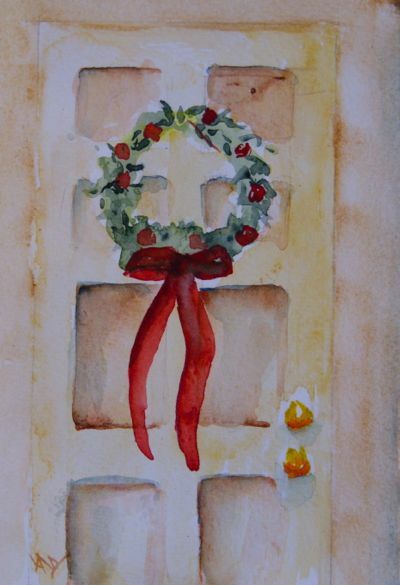 The classic Christmas wreath on the front door is a welcome for friends and family. With only one more day until the Christmas turkey gets cooked, we’re all getting ready for the knock on the front door. 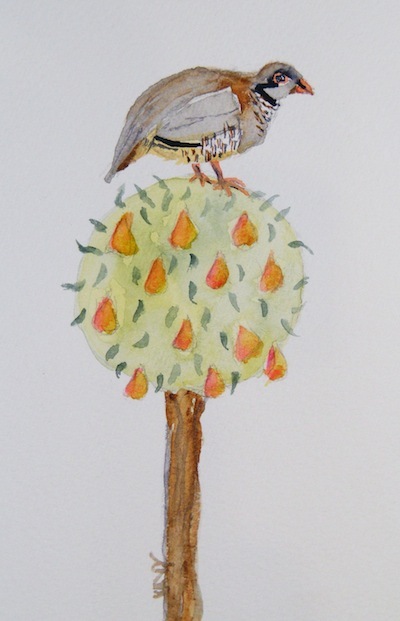 Australian watercolour artist, Anita Bentley is today’s advent artist. Her paintings capture the colour and clarity of light of Australia. Anita also has a Facebook page where she shares her art. Not turned into jelly yet, but when they are, the meal will be delicious. 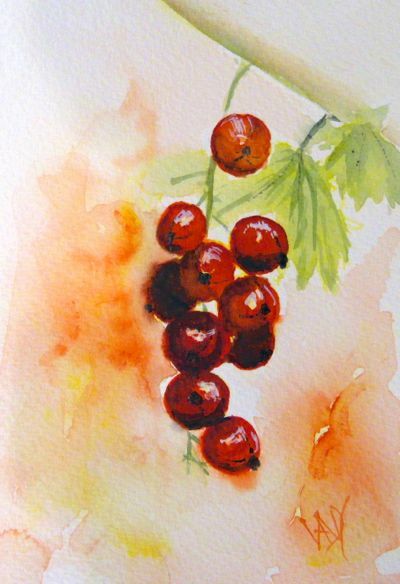 The glorious colour and translucence of red currants makes them great subjects for watercolour. This is the Advent 22 give away. Today’s Advent artist is Cambridge ceramicist, Katharina Klug. Her work is characterised by beautifully simple form and colour. She shares images and thoughts about her work on her Facebook page. Fired Moment from R & A Collaborations on Vimeo. One of my favourite aspects of watercolour is the way the paint creates wonderful surprises. I think this is probably one of the greatest thrills of working in watercolour for most artists. 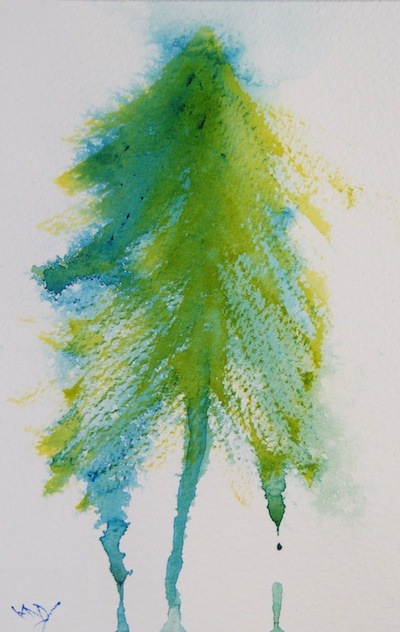 This little fir tree is a perfect example – painted with only two colours. The first layer of paint in Daniel Smith Green Gold was applied reasonably dry so that the dry brushstrokes created the branch structure. Then a second layer of paint (Pthalo Turquoise – also Daniel Smith) was applied again using dry brushstroke. The final step was the risk and the thrill. Spraying water from a reasonable height softened the turquoise and filled out the tree. This is today’s Advent give away. David Poxon is my advent artist for today. I first encountered David’s work at the Royal Watercolour Society’s annual exhibition at The Mall Galleries a couple of years ago. David’s painting of a barn door caught my attention and I started following his extraordinary work. David paints machinery and parts of buildings which have been abandoned by people and are showing a degree of decay. His realism is amazing and his paintings so evocative that I sometimes think I can smell the rust or the rotting wood. Recently, David built a studio in which he will run a series of workshops starting next year. For more information about David’s workshops, you can drop him an email. 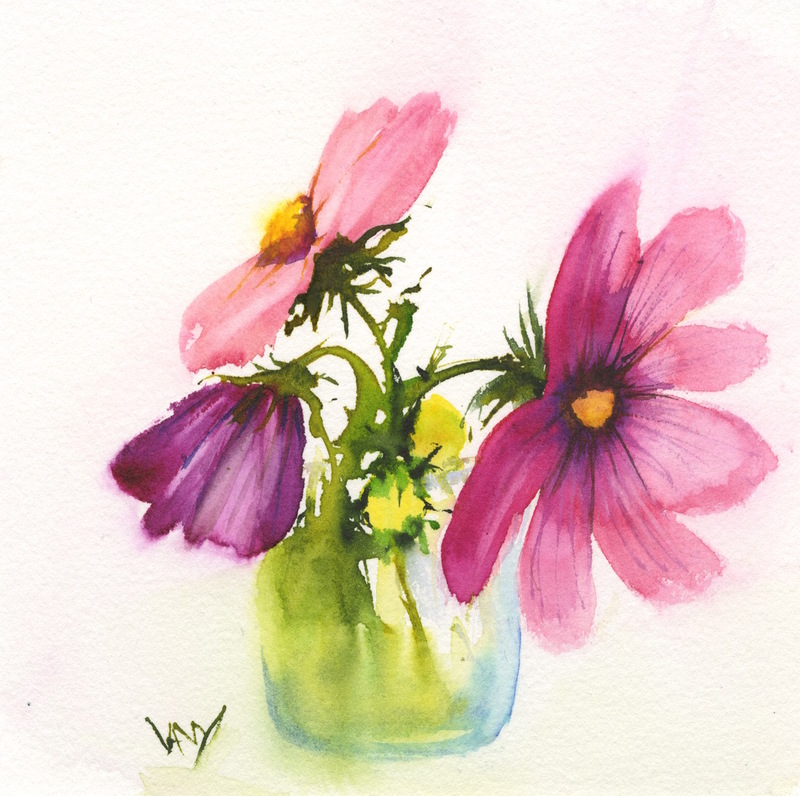 Christmas Flower (watercolour 4 x 6 inches). Hellebores (Christmas Rose) are found across Europe. One of the legends around them says that it emerged in the snow from the tears of a young girl who had no gift to give the baby Jesus in Bethlehem – hence their common name. This is today’s advent give away. Today’s Advent Artist is Val. 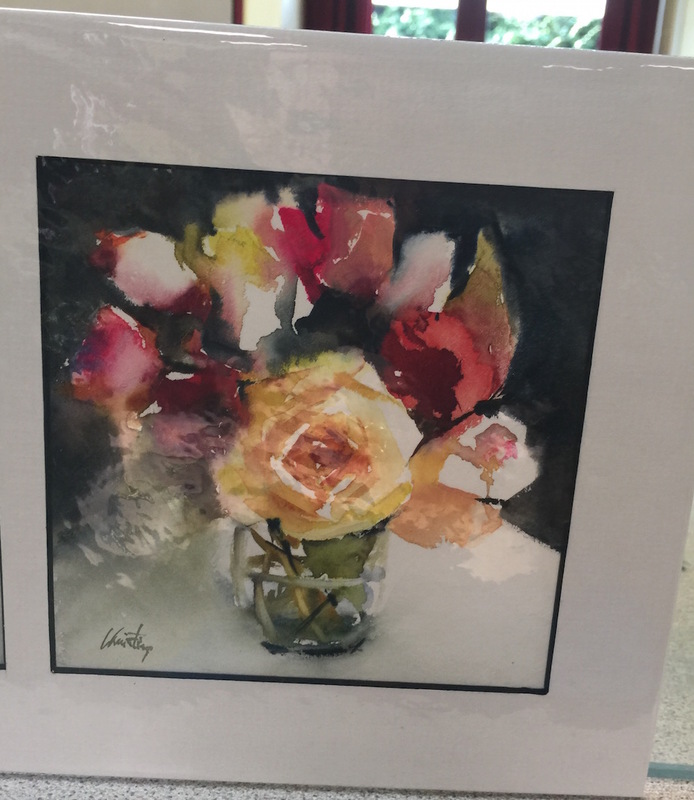 My first forays into painting were a result of Val’s inspiration and enthusiasm. She only started painting quite late in life. 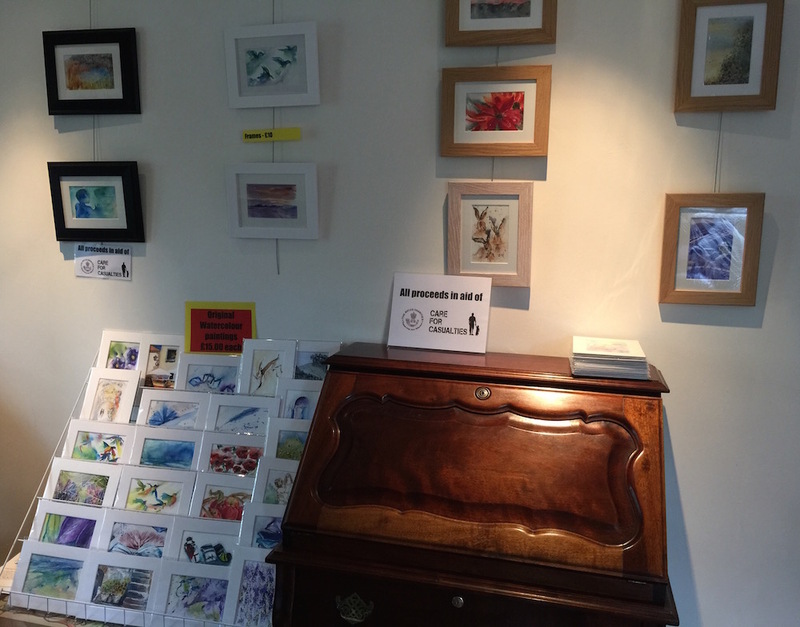 Val loved her painting, joined in with other artists in the area, and created beautiful delicate watercolours. Val’s funeral is today and I want to remember her joyfully for her lovely work as well as for her laughter and her go-ahead attitude. This is an opportunity to celebrate her love of art and in particular, painting. Today’s Advent give away was another one that made me smile. This feels like one of those moment in every family when someone decides to have a little fun at the expense of a sibling. 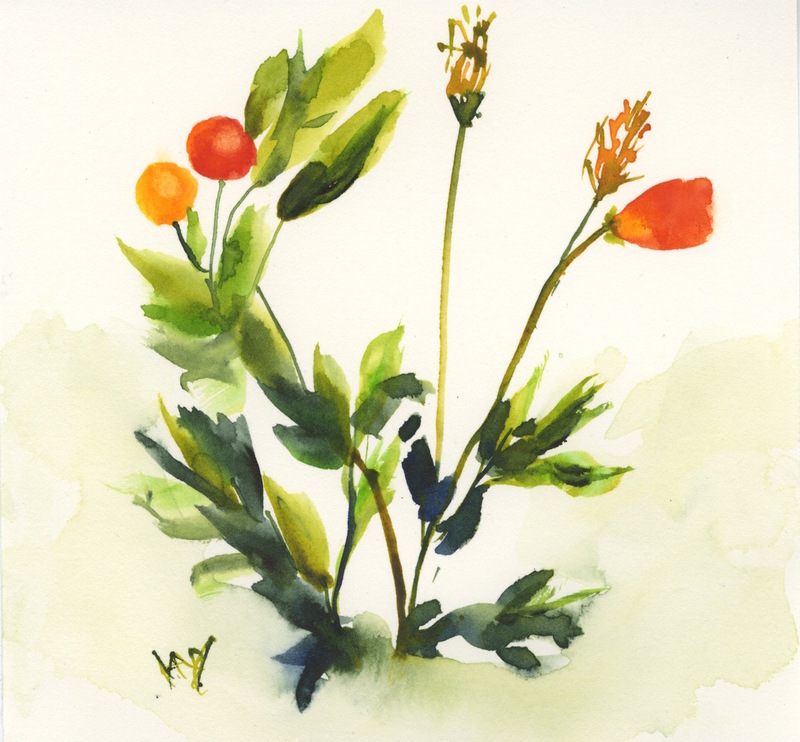 Cristina Dalla Valentina paints delicate, luminous watercolours of woodlands and plants. Her paintings have an ethereal quality that invites the viewer to explore her fantasy world. Cristina also has a Facebook page you could follow. I’m starting to find it challenging to find mew ideas for paintings – and I have seven more days to go. As these paintings are all being given away I’m looking for subjects that aren’t so Christmassy that they couldn’t be enjoyed all year round. This was a suggestion from Helen when we were discussing the give away series on Sunday. I decided to have a bit of fun with it. 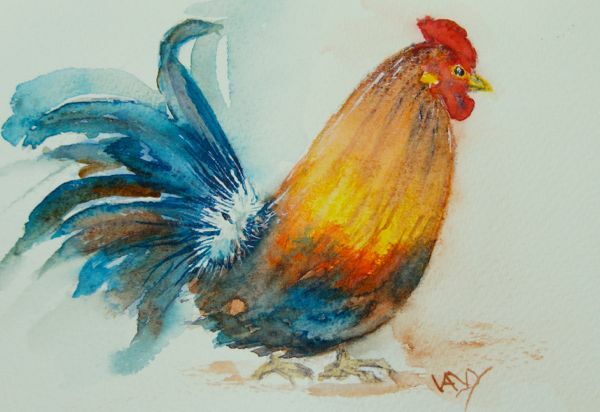 My Advent Artist today is Wendy Griffin. I met Wendy through a photo diary website where I was posting photographs of my paintings. I’ve got to see more of her work as she’s developed her Facebook page and it is extraordinary. Wendy is based in Guernsey so her seascapes are wonderful and evocative. This one is a bit of fun. 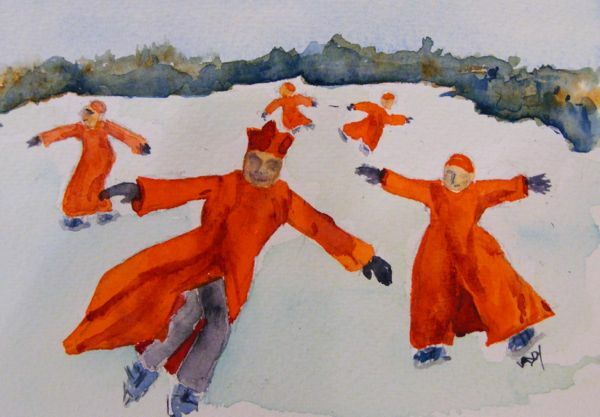 I saw a picture of choir boys ice skating and my initial thought was that their cassocks made wonderful shapes as they moved. You can almost see the speed of the air blowing through them as they skate. Then, for some reason, the image of a bunch of cardinals skating popped into my head. Made me laugh – and had to be painted. This is today’s Advent give away. Another photographer today: Lukas Renlund. I love his Steal my Photograph project. It’s kinda like the advent give away – but a lot more hard work by the look of it. Check it out – and have a look at his Facebook page while you’re at it.